The strategic undertones of U.S. freedom of navigation operations in the South China Sea have distracted from the legal character of the Freedom of Navigation Program, which was first set up in 1979 to backstop the U.S. negotiating position during the third UN Conference on the Law of the Sea (1973–82). The logic of the program—that the United States use military operations to assert its interpretation of international law—hinges on the willingness of U.S. leaders to accept a degree of operational risk. The program also involves a diplomatic component whereby U.S. diplomats conduct “consultations and representations” to explain the meaning of the military’s operational assertions, and U.S. experts engage with their counterparts in coastal states to provide recommendations in the early stages of the promulgation of maritime claims. This combination of military and diplomatic assertions is unique: no other country has a formalized freedom of navigation program. The necessity for diplomatic communications and operational assertions to maintain the balance of interests reflected in the LOS Convention as law is often not well understood. It is accepted international law and practice that, to prevent changes in or derogations from rules of law, States must persistently object to actions by other States that seek to change those rules. Protest “must, at the very least, be repeated” and “must be supported by conduct which opposes the presentations of the claimant State.” Naturally, States are not required to adopt a course of conduct which virtually negates the rights reserved by protest. Consequently, States will not be permitted to acquiesce in emerging new rules of law and later claim exemption from them at will. Acquiescence is the tacit acceptance of a certain legal position as a result of a failure to make a reservation of rights at the appropriate juncture. For acquiescence to arise, a claim must have been made and accepted. The claim must be made in a manner, and in such circumstances, that the other State has been placed on notice of that claim. The conduct that allegedly constitutes acquiescence, or tacit acceptance of that claim, likewise must be clear and unequivocal. The failure to make a timely protest in circumstances when it reasonably could have been expected to do so may constitute tacit acceptance of the claim. Thus, the program is primarily a legal tool and does not have, on its own, a rationale stemming from strategic calculations such as deterring coastal state behavior. The U.S. Department of Defense publishes annual reports detailing operational assertions that are conducted by the U.S. Navy as part of the program. Annual reports extending back to fiscal year 1993 are accessible online. There is one exception: operational assertions conducted during the period of fiscal years 2001 to 2003 are summarized as one report. Aggregating these reports, this Maritime Awareness Project Fact Sheet will highlight some of the key trends and patterns in the Freedom of Navigation Program over the last 23 years. A considerable limitation on our understanding of the program is imposed by the fact that the Department of Defense indicates in its reports whether a country’s claims were protested more than once in a fiscal year, but not precisely how many individual operational assertions were conducted. Media reports cannot be relied on to ascertain this information because individual operational assertions are not routinely reported in the press and are almost never announced publicly by the Department of Defense. How often does the United States conduct operational assertions? The United States challenged a large number of countries during the 1990s, which is not surprising given that the United Nations Convention on the Law of the Sea (UNCLOS) was still a relatively young treaty during this period. The number of assertions sharply declined in both 2000 and 2001, but then steadily increased from 2007 to 2011. The annual reports issued by the Department of Defense as part of the Freedom of Navigation Program may not include all naval operations that violate domestic laws of coastal states that the United States considers incompatible with international law. For example, if a U.S. Navy survey ship operates without prior permission within the exclusive economic zone (EEZ) of a country that requires such permission, the operation might not be part of the Freedom of Navigation Program but, instead, motivated by other considerations. Whom does the United States protest? 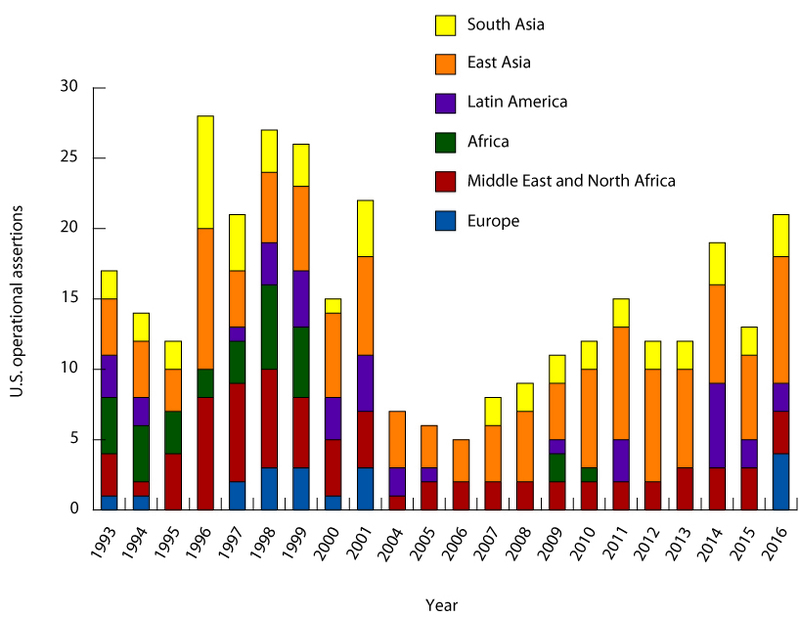 Assigning each country to a world region—Europe, the Middle East and North Africa (MENA), Latin America, Africa, South Asia, or East Asia—it is clear that there has been a marked increase in the proportion of total operational assertions that are conducted in East Asia. The other notable trend is a sharp downturn in the number of operational assertions conducted against African countries (excluding those of North Africa, which fall under the MENA category). In addition, there were no operational assertions against European states from 2004 until 2016, when the U.S. Navy protested claims of Albania, Croatia, Italy, and Malta. The United States will likely continue to conduct a large proportion of its protests in the East Asian region, given its ongoing disagreements with countries abutting the South China Sea over rights in their territorial seas and EEZs. Except for Brunei, all the South China Sea claimants have been subject to protests. China’s maritime claims in particular are regularly the subject of naval operational assertions. Which “excessive claims” does the United States protest most frequently? example, prior notification requirements or innocent passage only. Each unit represents a country-year, which can be subject to protest on the basis of multiple types of U.S. objections. That is, country-years are counted multiple times when a country is subjected to operational assertions for multiple reasons in a single year. Graphing these assertions by type group (as assigned in the above table) gives a slightly clearer picture of the trend. 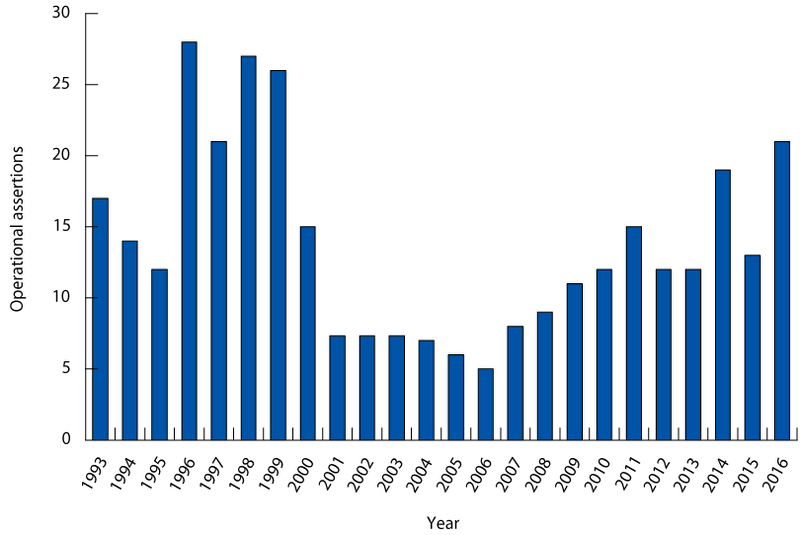 One trend in the data is the continuous prevalence of assertions against restrictions on ships traveling through a coastal state’s territorial sea. These restrictions usually take the form of a legal requirement to notify or obtain permission from the coastal state’s government before transiting through the 12 nm zone. Conflicting interpretations of how the right of “innocent passage” through a coastal state’s 12 nm territorial sea can be exercised—or circumscribed—have existed since long before the right’s codification in Articles 17–21 of UNCLOS. At least with respect to this particular legal dispute, the disagreement persists and has been consistently protested by the United States. 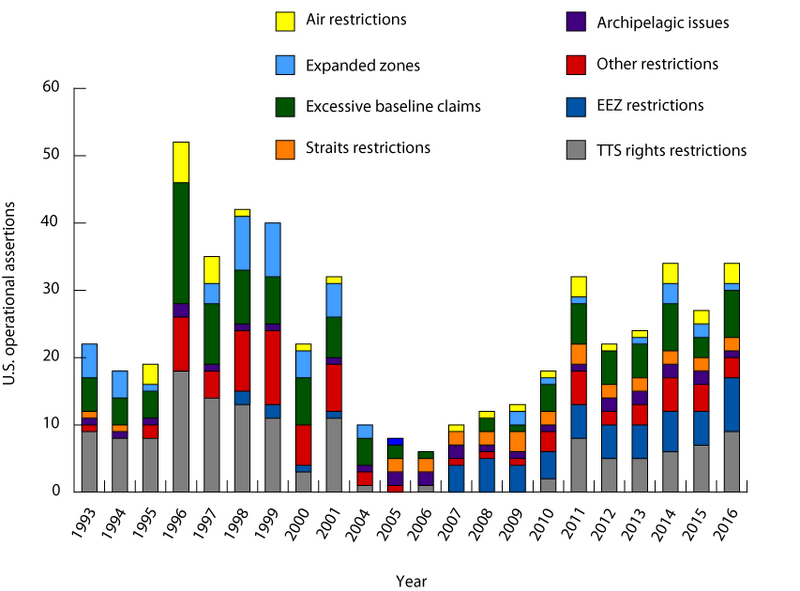 A second trend is the marked increase over the last decade in assertions against restrictions in coastal states’ EEZs. The United States seldom conducted these assertions during the 1990s. These restrictions might include, for example, prohibitions on military activities or surveys in an EEZ. One explanation for this increase could be that coastal states have taken time to introduce and adopt domestic legislation to exercise their right to an EEZ. The majority of freedom of navigation assertions fall into three categories: complaints about (1) territorial sea restrictions, (2) EEZ restrictions, and (3) excessive baseline claims. Certain types of excessive claims are protested more frequently in East Asia than in other regions. 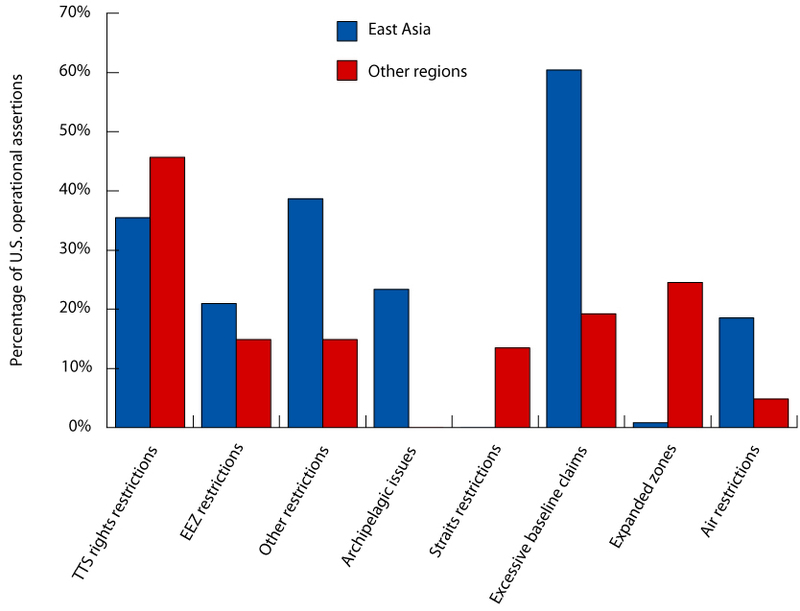 The following graph compares the frequency of each type of protested excessive claim, as a percentage of all operational assertions, in East Asia versus all other regions. Only in the categories of territorial sea restrictions, straits restrictions, and expanded zones are operational assertions equally frequent, as a percentage of all assertions, inside and outside East Asia. In the East Asian region, protests against EEZ restrictions, excessive baseline claims, and air restrictions are all more frequent. As Indonesia and the Philippines are the only archipelagic countries against which the U.S. government has conducted operational assertions, it is natural that these operations are more common in East Asia.